The zen chickens are inspired by the great and fun zen calligrapher, Alok Hsu Kwang-han. Alok's videos inspire me to create and meditate in Sumi ink. Another inspiration is Expressive Drawing by Steven Aimone. I am inspired by chickens themselves, and my favorite breed of chicken is the silkie. Croquis are elongated and idealized figures. Fashion gives croquis a reason to be. Fashion projects or hides who we are inside. The Pacific beaches are dramatic places with big waves, rocks, cliffs, and spray. The Pacific shore pulls you towards it, even as it shows you a strong element of danger. I sit by the Pacific on the beach or above, on the cliffs, and let paint react to the changing moods of the ocean. The Atlantic shores on the coast of middle and southern Florida are restful and joyful. The Atlatic Ocean paintings are summer vacationy and engage in Latin rhythms. The Atlantic Ocean work includes the bright pastels typical of my home town, Miami. I paint with sea water and pelican feathers. Grids beat a rhythm of repeated shapes. Inside the shapes different colors of soluble pigments flow together to form poetic combinations within each shape in the grid. You could say that the combination of rhythm and poetry make a color song. In design the grid is a key tool used to customize layouts on and off the web. The word abstract means to separate something from something else. Abstract art doesn't represent a person or an object. However, abstract art can represent or evoke an emotion or mood. .
Abstract painting is like haiku, you distill and take away until the composition is complete. You may recognize a thing or figure in the Abstract Box. But what you recognize is really in your imagination as much as in the painting. Ask another visitor if they see what you see in an abstract painting. Walk around your neighborhood with India ink or a marker. Draw the little plants you find all around you. In spring the plants bloom. Many other artists, in many cultures, in many styles, have painted flowers. My favorite flower-painting artist is Emile Nolde. Nolde's poppies and anenomes are beyond belief. The young corn was growing in a field in Elgin. I set up in the field and drew all these paintings in 2 sessions in 2014. The corn grows so quickly. My goal is to capture the vitality of the crop in its youthful plantlife. 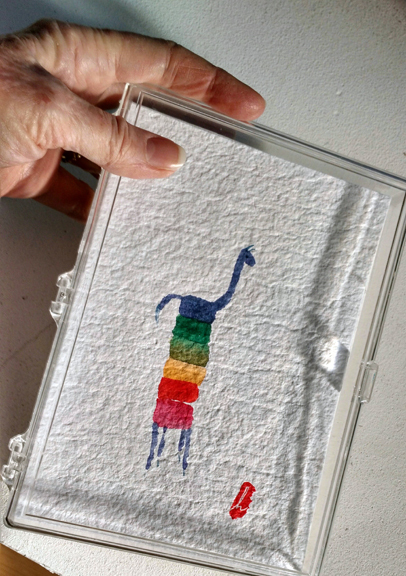 Color mammals explore different combinations of watercolors as they diffuse into each other in short strips. Paint strips of colors next to each other in a stack. What if you add legs, neck, head, and tail? Some of the mammals look like skinny llamas and others look like giraffes. They are simply color mammals. I grew up in Florida surrounded by water and water birds. My Uncle Laddie (James McGibbon Brown) taught me to paint. Uncle Laddie painted the waterfowl of the everglades and was especially into egrets. I have waterfowl and watercolor in my heritage. These waterfowl paintings question the interactions of positive and negative space, like seeing things in the murk of the swamp. Visit the Pecos Seminole Canyon. I used powdered pigment and thick texture medium to capture the texture of the rock walls of the pictographs. The meanings of the original paintings are buried with the people who painted them. My paintings are interpretations, not copies. A circle is a completion. A zen circle is a meditation. Circles connect or bubble-bounce against each other. Animals from the sea and the land. Pets in the homes of my friends. I use the colors, shapes, and textures we find in Big Bend. I am also inspired by the art community in Marfa and the minimalist art in the galleries. Yes, I saw and painted the Marfa Lights. Nearby the International Space Station is guided. Every year thousands of people come to Austin to explore and promote the next networked thing. I make art-notes inspired by the interconnected energies converging at the convention. Paper53 is a drawing app. Did you know your tablet and your smart phone is also a sketchbook? Download a drawing app today! Send illustrated texts filled with lively lines, shapes, and colors. Spellerberg Projects asked for a collection of images to use to create invitation post cards. These images were scanned and 10 of them printed. 200 postcards went out to you and you came to the show. This box holds drawings and paintings that don't fit into the other categories. Look for animals and ghost chairs. This box holds a mix of paintings. They are larger than 5x7 inches.